The Pioneer Mk I, Mk II and TachyTele models are based on the legendary Hanhart chronographs of the 1930s. Now they are also available with elegant, off-white dials. Hanhart has been a key pioneer in the field of reliable, highly functional precision chronographs. 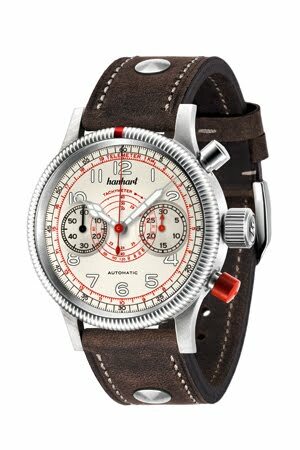 In 1938 it designed a mono-pusher chronograph for naval officers with its own “Calibre 40” movement. This was followed just one year later by the first pilot’s chronographs with Hanhart’s manufacture movement “Calibre 41” – a movement with column wheel and flyback function. When the Swiss-German watch brand re-issued a range of faithful replicas of its legendary chronographs in the 1990s, it carried on its long tradition and maintained its high level of expertise. In 2012, Hanhart will introduce versions of the Pioneer Mk I, Mk II and TachyTele models with elegant off-white dials. All three models are distinguished by the typical characteristics of a Hanhart chronograph: thanks to the modified automatic calibre, they have a “bicompax” display format with a 30-minute counter at 3 o’clock and small seconds at 9 o’clock. The positioning of the upper chronograph button further away from the crown, for easier operation, is a modification that was made in Hanhart’s own workshop, while the red reset button has been the hallmark of Hanhart watches since 1939. The large, easy-to-handle crown and the thin, slip-proof fluted bezel which can be rotated in both directions and includes a red marking for recording time guarantee secure and simple handling. The dial is perfectly readable in any situation thanks to its large, glow-in-the-dark Arabic numerals and the distinctive hands which are slightly curved at the ends and mounted onto the dial with the smallest clearance possible. To guarantee maximum water-resistance and robustness, the Pioneer models are, like the archetypal models on which they are based, fitted with a sealed, screwed-down case back, which includes three indentations for the case key. The riveted strap made from firm, hard-wearing calfskin provides a secure fit on the wrist. The Pioneer Mk I is a replica of the first precision chronograph produced by Hanhart in 1938. All of the chronograph functions on this unconventional monopusher model – start, stop and zero setting – are performed by a single button and always strictly follow each other. Unlike its two-button equivalent, the seconds hand on this chronograph cannot be restarted from the point at which it is stopped; the next press of the button invariably returns the spring to the original starting point. This meant that the calibre used for the Mk I also had to be redesigned slightly. The crank which sits directly beneath the button that would normally be positioned at 4 o’clock has no function. A large shift lever is therefore responsible for the third strike on the chronograph cam. This cam has also been modified by Hanhart so that it has an additional tooth on its lowest level. The shift lever can thus control not two, but three positions. 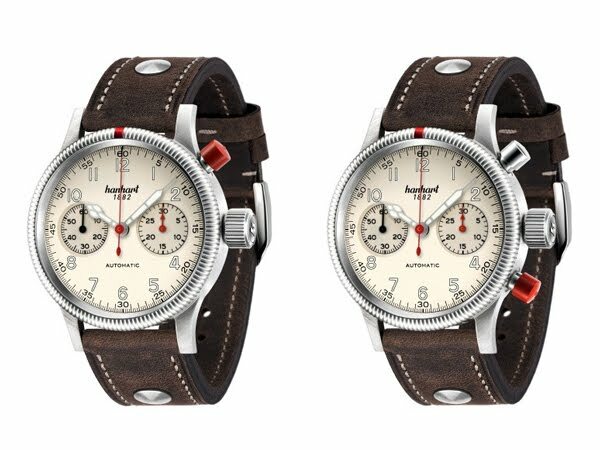 The Pioneer Mk II is based on Hanhart’s first pilot’s chronographs, produced in 1939, and has two buttons. The Pioneer TachyTele has the same design, but features in addition to the stop function two practical scales which are easily readable against the off-white dial, thanks to their red finish: the tachymeter scale for measuring average speeds is incorporated in the centre of the dial in a spiral formation. As this scale allows for a total of three revolutions of the stop indicator hand, it considerably extends the measurement range, enabling even relatively slow speeds of 60 km/h down to 20 km/h to be measured. The telemeter scale, which is printed on the peripheral edge of the dial, is used for measuring distances, taking into account the speed of sound.